Me and the R.C.M.B. Got your green on? I’ve blogged about my love for libraries—and even tried to support them by participating in the “Fill the Shelves” program. We don’t have a similar program in Canada, but I was intrigued to learn about a campaign launched in Calgary to turn pennies into books. 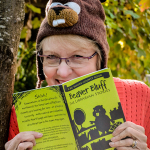 I contacted them to learn more—and then pitched the idea to some Vancouver Island librarians. With the Canadian penny now out of circulation, they jumped on the idea. I’m happy to say VIRL designed a great poster, and equipped all of its 38 branches with free penny rollers that anyone can pick up, fill and return. Turning pennies into books is happening here! Free rollers from VIRL – just fill and return. Even if you’re not an Islander, who says you can’t do this in your own back yard? 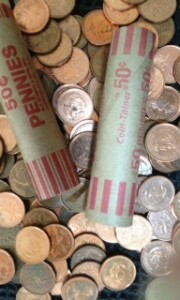 I doubt there is a Canadian library that would reject pennies for books if you delivered them rolled. There’s never enough funding to offer all the materials libraries would like to. Why not try to talk your local library into mirroring Calgary’s program? They just might be as keen to give it a try as VIRL was! Kudos to The Calgary Public Library Foundation for a great idea they happily agreed to share. 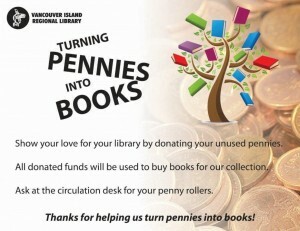 Their media release says that a young boy recently walked into Calgary’s Bowness branch with his cloth bag of pennies and said “I want to help you get more books.” His mother was showing him how to give back and thank the library that provides so much to him. Calgary Campaign Administrator Christine Gingerick adds that a local seniors’ residence is challenging other seniors groups to see who can collect the most pennies for the cause. Good for them! Young, old, or in-between—our lives are enriched by our local libraries. Let’s work some magic for them by turning our pennies into books. It just makes cents! P.S. Feel free to share this broadly. I’d love to hear your comments (below). Please let me know if you succeed in turning pennies into books where you are.